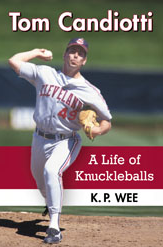 One particular myth about the knuckleball is that if a team has a guy throwing that pitch and that’s one of its best pitchers, it’s not a very good team. That’s not true for the Dodgers of the mid-1990s, when Tom Candiotti had a 3.50 ERA in 1995 while staff ace Ramon Martinez’s was 3.66. Thanks to great run support, Martinez went 17-7. Candiotti, with rotten support, was 7-14. That season, he proved to be on par with Martinez, the Dodgers ace. Some of the things Candiotti said didn’t make it to his biography due to word count. So, it’s nice to share his thoughts here. Candiotti’s thoughts about the 1996 divisional race were also not included in the book, but he had some thoughts about it too. “We were two games up [in the National League West] with three games to play, so we were already going to the playoffs [as at least a Wild Card team, being three games ahead of the Montreal Expos with three games left]. The Padres, the second-place team, were playing us in Los Angeles.” According to Candiotti, the Dodgers definitely wanted to win the division as opposed to being a Wild Card. “The way it was stacking up that year, if we won our division, we wouldn’t have to play the Braves [in the Division Series]. We much rather would’ve played the Cardinals, the NL Central champion. “So, we lost the first game [5-2 in 10 innings], and everyone was upset. It was down to a one-game difference with two to play. We lost again, 4-2, and now we were tied, with one game left in the season. For the last game, the big dilemma for [manager Bill Russell], was we still had our ace at the time, who was Ramon Martinez, available to pitch. That was his day to pitch. But they didn’t wanna pitch him there because they wanted to have him fresh to start the playoffs. Ramon pitched one inning to start the game, and then they took him out and threw Pedro Astacio in. Astacio ended up pitching a great game [with six-and-a-third scoreless innings], but the Padres threw Bob Tewksbury. They both threw phenomenal games. It was a great game, but it was kind of a weird thing. To me, it felt like the Padres really wanted to win that game. And it felt like, because we were already gonna be in the playoffs, we didn’t have as much fire playing at that time.